In setting up a transcription business, free transcription software is a necessity. But this kind of software is also indispensable tools for those who have decided to leave regular employment and become home based virtual assistants. There are programs that need to be purchased, but why opt for those when you can just download equally effective tools for free? Here are ten of the best options available for download. It is up to you to examine the pros and cons of each and decide which fit your needs. All of these platforms are fully automated systems that do not need additional personnel to run, and most are pretty straightforward and require nothing more than basic computing skills. Listen N Write is a standard transcription software that is designed for MP3 and WAV files. It does not take up so much space in your computer, yet it has the basic capabilities expected of any transcriptions software, including playback, text editing, key control and book marks. Your transcription tasks are significantly simplified and the tool is effective in helping you write what you are listening to as fast and as accurately as you need to. But you need to work hard still, because it has no automatic transcription features nor does it have voice or speech recognition technology. 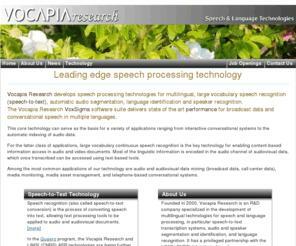 The VoxSigma suite is an offering from Vocapia Research. It has multiple language capabilities, and among the world languages it supports are Spanish, French, Arabic, Russian, Dutch, German, English, Mandarin, and Portuguese. This software is intended for professional use and for hefty workloads. It works best in dealing with challenges such as transcribing a speech recording with a noisy background. It is also designed to deal with loads and loads of audio and video files that need transcription in real-time or in batches. The VoxSigma suite is suited to the requirements of call-center data transcription. The Enhilex Medical transcription software is more than a tool for medical transcriptionist. It is also great for word and folder listing and in managing related organizing tasks. Your folders will self sort and there is no limit to the words and folders that it can manage. The full version will cost you a few dollars, but the trial version is absolutely free. InqScribe also supports multiple languages and has the capacity insert time codes and utilize analysis codes. It is simple to use and very flexible such that the strengths of the user are maximized. You can view a video and transcribe it using one window. One distinguishing feature of InqScribe is its capacity to creating subtitled movies. Why not convert your transcribed work into a movie with subtitles? You can also use a foot pedal for controls, leaving both hands to type. In this way, you get to complete your workload and finish deadlines on time. What is “Dragon Naturally Speaking?” This innovative software is offered by Nuance Communications. Its Mac version is called “Dragon Dictate.” This tool has three main functions, namely command input, dictation, and text-to-speech. This program has voice recognition software that becomes handy in a network set-up as it has good voice profiling capacity. You may use this to dictate text that is soon transcribed in written form. Customization of commands is allowed in the Pro version. For those who prefer to use Apple hardware and software, MacSpeech Scribe is our recommendation. It is a very efficient and smart tool to use, and guarantees fast transcription speeds. 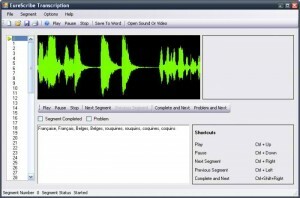 Its main function is to transcribe recorded dictation by a single speaker that is saved in any of the following standard audio file types: wav, .mp4, .m4a, .m4v, .aif, and aiff. This program can process recording made using any handheld devices for as long as they are in the supported formats. Nuance Communications owns this software now. HyperTRANSCRIBE by Research Ware is an easy to use tool for a huge array of video files and audio files. This tool employs QuickTime to play various media formats, including .MP3, MPEG, WAV and AVI. HyperTRANSCRIBE is one of the most convenient transcription programs available in the market today, and it comes with a pedal, freeing your hands for typing. This tool is guaranteed to give you the speed that you need in transcribing audio file to text documents pronto. MAXQDA is a text analysis software that does an effective and efficient comparative analysis of audio or video and document files for assessment purposes. And since MAXQDA has its own built-in media player, professional-level transcription can be done directly. Very handy transcription tools are provided, such as pause and playback, sync mode, time stamps, etc. The output from this program may also be used in another transcription software. Another transcription software that is guaranteed to ease out the challenges of the job is EureScribe. This program supports many audio and video formats such as WMA, WAV, MPEG, AVI, DVD, and MP3. Keyboard shortcuts make the job much faster than it would be if you’d use a lot of the mouse. Text transcriptions are save in RTF format or as subtitles. Whether your system runs on Mac or PC, the Express Scribe transcription tool with it foot pedal control is sure to assist you in coming up with a professional job every single time. You can also opt to just use the hot keys, of course, but you can maximize all the features of this program for fast results. And you won’t have to pay a single penny for multi-channel control, file management, and playback features. Quite disappointed, most of these are not free. cheaper than others ($9) and even more functional and convenient. Highly recommend it. Useless post since these are not compatible with the latest version of OSX for Mac, which the writer should know. http://www.uTranscribe.tv is 100% free but it requires the latest browser . I think human transcriber is better than these software.There are company which provides 100% accurate transcription services. But we can use these software help for faster work done. http://www.usubtile.tv is not free but our plans start as low as $49 for 5 hours of automated Speech to Text and we also now offer Human powered transcriptions starting at $1.30/min. All on the same platform. Why are these 10 programs Being advertised as being FREE when they are NOT!!! I have been using Express Scribe for awhile now, and have found that some dictations are very unclear. I discovered this because I was fast forwarding through one that was unclear. I had slowed the fast forward down to 100% as I tried slowing the dictation down in real time to try and understand it better. I could understand the dictation almost perfectly while fast forwarding, there was no static or background noise interfering. I’m considering trying a different one, but I’m not sure that it’s even an issue with the software. Has this happened to anyone else? I used to use one of the free ones (the most popular one) and in so far as it plays audio nicely it is fine. But, it didn’t deal with the need to put timestamps into a document, find timestamps in a document or edit or delete them (amongst other things). I wrote some macros in vba to put ts into the document but was still not satisfied. I could go on and on about this and other tedious aspects of transcription but I’ll spare you that. After 4 years of development I’ve released my own software. I’ve been using it for years and developing it along the way. I wonder how many of the other software authors have the benefit of actually doing transcription work? The best I’ve found is http://www.theftwtranscriber.com/. It offers auto time stamps & great sound…. many features. Download & use for basic version (which works great) is free. There is an upgrade that offers more features for only $1 a month. I installed it but not create text file. Can you send me how i must use it ? I’m looking for something which should be quite simple and straightforward – Is there a piece of software that will listen to a pre-recorded audio file between 2 people having a conversation, that will automatically transcribe the audio into text? Pinpointing the right voice-over talent is very important regardless of the project that you want them for. But the challenge that is faced by most people is how they can go about the process so as to successfully hire the right voice-over. professional voice over. With the launch of timelines for business Pages, Facebook has rolled out more than just a new aesthetic. They’ve introduced new ways to engage with your fans. mobile plugin wordpress. Given how painful transcribing audio is, people repeatedly ask us why there is still no software that can automatically take an audio and spit out its transcribed text with good accuracy. Now, it’s not entirely true that there is no such software – there are many, but they don’t help in transcribing real-world audio which typically involves handling multiple voices and all kinds of background noises. Training a machine to recognize human voice has proven to be very difficult due to the variations in how people speak a particular language. Despite being the most widely spoken language, English itself sounds considerably different in various parts of the world. Even if everyone spoke a language the exact same way, there is still the added difficulty of training the system for different voices – from young to old to male to female to hoarse to soft to – you get the drift. Even the same person tends to speak differently in different situations, for example, during a moment of excitement or a bout of cold. Let’s not also forget that some people speak faster, while others speak slower, with lots of ums, ers and uhs, which aren’t even part of any spoken language! Arriving at a speech model that can handle all these variations (like humans do) is really tricky. Interpreting speech requires a good understanding of the overall context. Humans are gifted with the ability to interpret fuzzy data and automatically deduce the missing parts based on the context. Machines are really bad at disambiguating the meaning of words and phrases as they lack the ability to comprehend the bigger picture. The words “sail” and “sale” sound the same, and there is no way to distinguish between the two without first understanding the overall context. Such a “context” might not even be available till later on in the speech! It’s not easy to wreck a nice beach. It’s not easy to recognize speech. It’s not easy to wreck an ice beach. Once again, an accurate transcription requires an understanding of what the speaker is trying to say in the context of the full speech. If the words are spoken slowly, with a clear pause after every word, machines stand a better chance. This is another reason why today’s technology is better at handling dictation and transcription of short sentences or commands than conversational audio. Speech recognition is an incredibly complex and resource intensive process. One requires a lot of tagged audio samples to train the system to recognize the plethora of variations in human speech. The fact that there are, at the very least, a quarter of a million distinct English words does not help. In addition, storing and processing such large amounts of high quality audio samples requires significant engineering resources. Based upon what I’ve read, and my experience, it takes a minimum of 4-5 hours to transcribe 1 hour of digitally recorded interviews. Now the real question is, what’s your time worth? Transcription process takes precision and accuracy, commitment and dedication, focus and patience.. They are used by Harward, Stanford.. The fact that such top universities trust with their transcripts proves quality credentials. This is a very helpful comment of things to keep in mind. I marvel at the power of speech in the human being and the plasticity of the brain. We have yet to create a computer to understand or replicate these linguistic and communicative abilities. Every time I have downloaded the “free” version of ExpressScribe, within a few days, I get a message that I cannot use my foot pedal unless I buy the Pro version. I’ve downloaded the “free” version from numerous websites, including NCH, and it happens every time. I don’t mind purchasing a transcription software, but I don’t use it enough to get a feel for it before I get the “no foot pedal” crap popping up after a couple of uses. Speechmatics.com offer an hour free transcription – seems from my testing to be better than Google and Nuance.